Mick Doherty thinks the greatest single franchise position in baseball history is left field for the Boston Red Sox. "Ted Williams and Carl Yastrzemski you know about. Before them came Duffy Lewis -- who would have made a bushel of All-Star Games had there been such a thing back then -- and after them came Jim Rice, Mike Greenwell and now Manny Ramirez, the latter who is also headed to the HOF". Naturally, this question got me thinking about the strongest position in the history of the Toronto Blue Jays. I believe it's first base, and commenter Magpie agrees. From 1977 through 2007, here's how our first basemen stacked up against the league average for OPS. Willie Upshaw, Fred McGriff, John Olerud and Carlos Delgado made for a nice run at 1B. We've been blessed. For the unaware, On-base plus slugging (OPS) is a baseball statistic calculated as the sum of a player's on-base percentage and slugging percentage. What I'm curious about is that the league average is always exactly 0.100. I suppose that's a result of the way this particular stat is calculated? Buffalo Boy, with all due respect to Damo, O-Dog and Hill, Alomar is the only class act in that group. 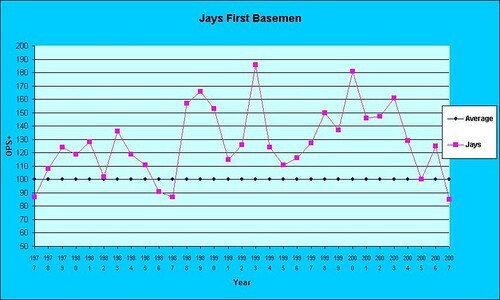 Ajax Mike, the commenter who put together that chart put the average at 1 and calculated Blue Jay 1st base OPS relative to that point.